One of the things we enjoy most at Tools for Working Wood is chewing the fat with our fellow woodworkers. We also love it when the showroom has a bunch of people from different walks of life and sometimes even different continents chatting about woodworking, sometimes giving advice or admiring pictures of each other's projects. So we decided to set aside a bit of time every Friday afternoon to get together. The idea is to hang out, have some snacks, and learn more about some aspects of woodworking. The structure of the Woodworkers' Hangout will evolve depending upon the interests of people who show up, and we have some different ideas for future weeks (for example, playing with different kinds of finishes). But right now we're taking out some interesting antique items. Last week we put on the white gloves and looked at a first edition of Joseph Moxon's Mechanick Exercises. This Friday, it's hands-on with some really old English mitre planes. The picture above shows the planes I will be bringing in. The oldest on the left is from the mid 18th century. I am not sure if it is usable, but this plane and the one next to it - a Gabriel mitre plane circa 1790 - are two of the oldest metal planes in existence. Probably fewer than 80 survive that are older. Christopher Gabriel is also known as the seller of the tools in the Seaton chest. The Gabriel mitre plane really reflects the English box mitre plane at its peak form (with a form that didn't change at all through the 19th century). Next to the Gabriel is a unmarked "Improved" mitre plane, probably by Spiers from the late 1850's or so. This plane reflects a time when users were adopting metal bench planes. I think this style was a last ditch attempt to transform the larger mitre planes into something useful. It failed. The style is a fairly rare form. Finally, all the way on the right, is a small miter plane by I. Smith, probably dating from 1860's or so -- really the end of the road for the box mitre. Its most common application was for keyboard makers to plane ebony and ivory and other exotics, but by that time the world of mitres had moved on. 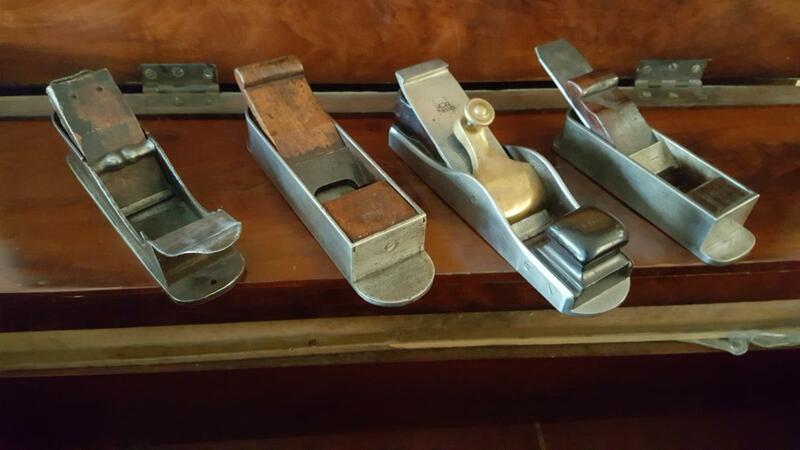 Spiers and Norris, the two most famous steel plane makers, did make mitre planes in the late 19th and early 20th centuries (I also have a much later Spiers mitre plane), but both companies made their reputations on bench planes of various sizes and styles. If you search my blog for "mitre plane" you will find I have written a lot about the details. I am really excited after all these years of writing about the tools to actually set some time out so people can use them. The plan for Friday (June 8 2018) is to have these planes (three of them at least) sharpened up and ready for action. If you are in the New York area on Friday afternoon and want to give them a go, come on by! As a tool collector, I think it's really important that we experience some of the older designs -- sort of a not-so-old Experiential Archeology. I think using these old and iconic designs will give you a first hand chance to experience at least a little of what our forebears experienced, and gives a practical context to these old tools. N. B. If you have the urge to come to Brooklyn this Friday for the hangout (and we would love to see you) there is parking in front of our space and in the area, you will miss most of the traffic coming into the city on a Friday night, and after the event you can go out for a bang up evening on the town! If the weather is nice you should also go for a walk in Greenwood Cemetery. It closes at 7:00. If you bring disinterested friends and family with you we can direct them to nearby places with things to do that are not tools. Really great that you are making time for people to experience this. That needs to happen- we've already lost so much of the skilled trade experience in our society in general. Sorry I can't make it to the city.